Our first set of questions is related to the decision-making process that you use for determining (a) whether to undertake a clinical trial, and (b) how that trial will be designed and executed. We should point out that we are only interested in the decision-making process for clinical trials evaluating safety and efficacy for new molecular entities (NMEs). Clinical trials that you may undertake for marketing, reimbursement, and/or investor objectives are outside the scope of our study. Is there a minimum rate of return that you require before initiating clinical research for an NME? If so, what is it? Is there a minimum revenue threshold below which you might choose to ignore even high-return drug development projects? If so, what is the threshold? If interviewee has small company experience: How does this picture change for small companies? Do you think it is important to reduce current source data verification costs? Does your firm employ risk-based or some other form of SDV at less than 100%? What percentage of laboratory/radiological/physical exam data collected during the course of a clinical trial is never used for the purposes of supporting the New Drug Application (NDA) to FDA? Please elaborate on the reasons for collecting such data. Does your firm incur substantial costs trying to identify biomarkers during clinical trials? Does the search often prove successful? If so, how important are the clinical trial costs savings from having identified biomarkers? In which specific therapeutic areas are biomarkers relevant? Our final questions relate to the barriers that may delay, hinder, or prevent successful completion of clinical trials for NMEs. Is your firm actively pursuing the use of newer electronic data capture technologies or other technological advances into clinical trial operation? How important or unimportant do you think such techniques will be in lowering clinical trial costs in the future? Do you feel that, as a (small/large) firm, you face a different set of barriers compared to (larger/smaller) firms? Additionally, do firms in your therapeutic area face a different set of barriers compared to those in other therapeutic areas? If so, what are the differences? Do you feel that there are clinical investigator shortages in the U.S.? Overseas? If so, how significant of a problem is this? Have you undertaken any measures to mitigate this problem for your company? If so, please describe. Are there any recent developments in clinical research that are proving helpful in mitigating barriers to drug development? Please elaborate. Are there actions that the federal government could take to mitigate drug development barriers (e.g., make changes to the clinical data submission requirements to FDA)? If so, what are those actions? Which of these government actions you enumerated above would have the greatest impact/potential to promote more clinical research in the short term? In the long term? What is the typical rate you use for discounting future revenues (i.e., weighted average cost of capital - WACC)? What types of tools/methods (e.g., real options valuation method) do you use for evaluating/ranking drug development projects? Please describe. Thinking about your recent decisions regarding NMEs, have there been individual factors or uncertainties in planning for clinical trials that have led you to decide not to file an IND for reasonably good candidates? Can you outline the reasons for not proceeding with an IND in the case of one or two recent decisions? Have you pursued regulatory approvals for any NMEs in the EU and not in the US specifically because of FDA clinical trial requirements? Next, we would like to inquire about the sponsor costs of conducting clinical trials to evaluate the safety and efficacy for an NME. We recognize that these costs may vary significantly based on the therapeutic area and other factors. Thus, “guesstimates” of ranges of hours/dollars/percentages are sufficient. 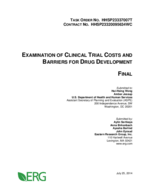 We are interested in costs incurred by the drug sponsor for managing clinical trials. Can you guesstimate how much you spend internally to manage a given clinical trial, for example, as a percentage of the fees paid to a clinical research organization? Can you describe what the major components of the sponsor costs entail (e.g., oversight activities, monitoring, etc.)? What percent of the total cost for a given clinical trial is related to one-time (study-specific) costs? Do you conduct clinical trials outside the U.S? If so, how many countries are typically involved? (If respondent nd cates “no” to 11, then s p to 12). If so, can you generalize about how the total cost of conducting clinical trials outside the U.S. (including all internal and external expenses) compare to that of U.S. based clinical trials for your company? Which components of clinical trial costs are rising most quickly in recent years? Can you offer an assessment as to why clinical trial costs are rising across the board? 14 Due to the Paperwork Reduction Act (PRA) requirements, ERG limited the number of interviews involving the same set of questions to fewer than 10. 15 The interview will be conducted in a semi-structured fashion with additional questions raised depending on the information provided by the interviewee. Notes for the interviewer appear in italics. 16 The questions will be tailored to the background of the interviewee and the type of company.